Among the most famous examples of the harm that plastic waste can inflict on aquatic animals is the case of Peanut the turtle. 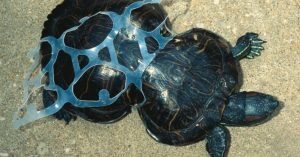 At a young age the wild sea turtle got caught in a ring of a discarded rubbery six-pack holder, and over time, as her body grew, she became permanently disfigured with her shape turning from the usual O into a near-8 owing to the squeeze that the plastic ring exerted on her carapace around halfway down. There have been myriad other known cases of animals, from seagulls to seals, getting their heads or other body parts caught in six-pack rings and other forms of plastic debris in poignant reminders that our wasteful consumer habits can have severe real-life consequences for other denizens of Planet Earth. Around the globe, an estimated 1 million sea birds as well as 100,000 marine mammals and sea turtles become entrapped in plastic waste or else ingest such waste and die. But now comes the answer to this particular bane of sea-dwelling creatures: edible drink holders that not only do not cause harm to animals but actually benefit them by providing them with some food. The brewery has already produced the first batch of its new edible/biodegradable drink holders by help of a 3D printer and is planning to manufacture them en masse to meet the needs of its current monthly output of 400,000 cans of beer. The aim is to “feed animals instead of killing them,” the company stresses in a promotional video for its product. The new fully biodegradable packaging is just as durable and efficient as traditional plastic can holders, the company says. On the downside, the new six-pack rings cost slightly more than the usual plastic variety, but the company hopes that its customers will be willing to shell out a little extra for the sake of the environment. It also hopes other breweries and drink manufacturers will follow suit and adopt this environmentally friendly technology. Even if you aren’t much of a beer drinker yourself, you should still welcome this development. That’s because plenty of other people do drink plenty of beer, which means plenty more plastic waste generated in the process. Americans alone drink around 6.3 billion gallons of beer each year, and they guzzle half of that amount from beer cans. In other words, plenty of yet more plastic six-pack holders keep ending up in the ocean day in day out as part of the staggering 8 million metric tons of plastic that is dumped into the world’s oceans globally each year. Creative solutions like this new edible and biodegradable drink holder can go a long way towards reducing the harmful effects of plastic waste on the environment. So here’s a toast to Saltwater Brewery and its new environmentally friendly can holders!